So for christmas I received a MAC voucher, and spent it more or less the same day I got it. Like a lot of us beauty bloggers I have a decent amount of makeup but one thing I'm lacking in (in my opinion) is lipsticks. MAC lipsticks are by far my favourite ever since I received 'Chatterbox' on my 15th birthday, which I still have as I can't bring myself to throw it away. 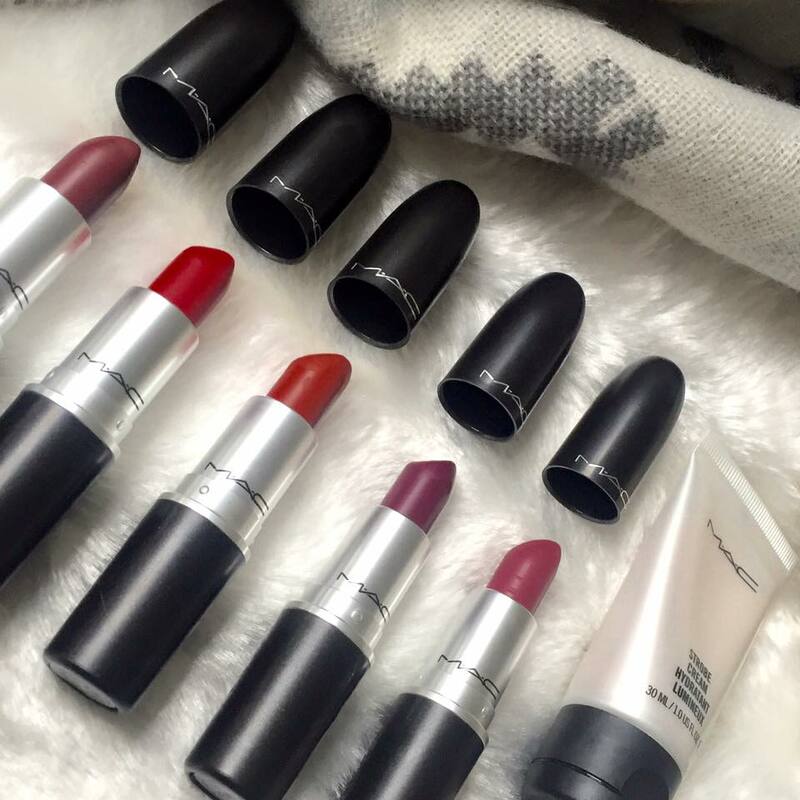 I am now almost 19 and only had 4 MAC lippies to my name so I thought it was time to buy more! This picture makes me incredibly happy and I am not ashamed to say it haha! to be quite honest with you I had no idea what lipsticks I wanted to get. I frequently hear people talking about the classics such as 'Honey Love' & 'Creme cup' but they just don't suit my skin tone. Luckily I had tried them in the MAC store a while back otherwise I would have probably bought them. I have now come to realise not only to I suit darker lips more I also prefer them. so the lipsticks i decided to buy, from left to right are.. This has been one of the lipsticks I have been too scared to try as it is such a deep berry red but I am so glad I bit the bullet and bought it. I always liked the look of berry reds but was never 100% until I started wearing the Rimmel Kate Moss lipstick in shade 38. Since then I have fallen in love with darer lip shades. I'm sure you have all heard of the infamous Ruby Woo. I put of buying this lippie because In all of the reviews I have read/watched every single one commented on hoe 'chalky' this lipstick felt on the lips and during application. Although this is true upon swatching it on my own lips it really didn't seem as bas as I thought it was going to be, granted I haven't worn it for a long period of time yet but I really don't think it extremely matte formula will bother me. Oh my gosh, where has this lipstick been all of my life! Chilli is a burnt red colour with orange undertones. In the past I have steered clear of orangey lipsticks as I really didn't think it would suit me but I always loved how they looked on other people. I still stand by that thought and the bright orange lipstick wouldn't suit me but chilli is such a tones down red/orange it is the perfect shade for my skin tone. The beauty of this lipstick is it could be dressed up or down. This is another lipstick I have wanted for a while but never bit the bullet and bought it, well until now. I have seen quite a few people rock this lipstick so I decided to be more adventurous lipstick wise and give it a whirl (ha! cheesy mac reference). It is again berry toned but way more purple rather than red. It isn't as vibrant against my skin tone as it is on paler people I have seen wearing it although I think I prefer that it isn't a bright looking on my lips. It still is rather daring but I think it will be one of those lipsticks that will grow on me and I will end up not being able to live without it. THIS LIPSTICK OH MY GOD! I have literally found my perfect lipstick ever! To me this lipstick is very similar to Twig but it has a more pinky undertone compared to Twig having a reddish/brown undertone. Captive is literally the perfect day to day lipstick for me. But I also think that it would look great paired with a deep smoky eye of a night time. Last but by no means least I bought a small version MACs Strobe cream. The reason i bought the smaller version is I wasn't sure if I would like it or not. I have hear nothing but good things about this products but I think I am still on the fence about it. I will definitely have to have more of a play around with it but will let you guys know how I get on with it! Apologies for this rather lengthily post! If you made it to the end then congrats, comment your favourite mac product down below as I would love to try them out! I love the shades you picked out! I only haven one MAC lipstick in Plumful and I really like it! Definitely want to try a few of their other finishes! Love this! High Tea and Fresh Brew are two of my MAC faves, these are gorgeous too!